OPEC has revised its forecast for global oil demand growth this year, noting that sanctions, tariffs, and the U.S. withdrawal from the Iran nuclear deal point to rising uncertainty over the global economic growth momentum. In its Monthly Oil Market Report released Monday, May 14, 2018, OPEC raised its global oil demand growth estimate by 25,000 bpd from the April report, to 1.65 million bpd. 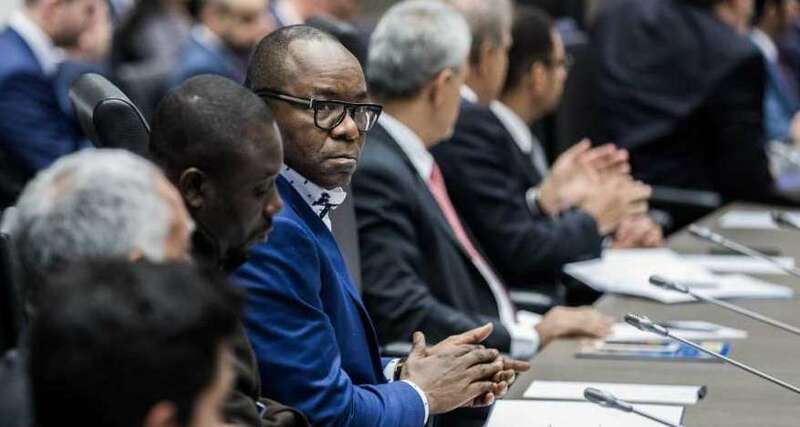 Emmanuel Ibe Kachikwu, Nigeria’s petroleum and resources minister, center, looks on during a news conference the 173rd Organization of Petroleum Exporting Countries (OPEC) meeting in Vienna, Austria, on Wednesday, Nov. 29, 2017. The upward revision was on the back of firm OECD data for the first quarter of 2018. Equally, better-than-expected data from Asia, including India and Latin America, prompted OPEC to revise oil demand growth in non-OECD nations higher. The Vienna-based institution says it expects China to lead oil demand growth this year, followed by other Asian countries and OECD Americas. In terms of non-OPEC oil supply, the cartel revised the forecast marginally higher compared to last month’s assessment, by 10,000 bpd, and now expects non-OPEC supply growth at 1.72 million bpd year on year in 2018. On global economy, OPEC pointed out that “the build-up of potentially disruptive concerns has increased,” citing the latest U.S. sanctions on Russia, tariffs on Chinese products in combination with considerable requests by the U.S. in trade negotiations with China, U.S. tariffs on steel and aluminum, prolonged North American Free Trade Agreement (NAFTA) negotiations, and the U.S. withdrawal from the Joint Comprehensive Plan of Action (JCPOA) with Iran. “In conclusion, global growth momentum seems to be well established in the short-term, and the most recent weakness, seen mainly in some OECD economies, may only be temporary. Major emerging economies’ growth dynamics have thus far counterbalanced this soft spot, and global growth may recover in the remainder of the year due to US fiscal stimulus and a rebound in OECD growth. However, after a period of a considerable growth, uncertainties seem to be on the rise,” OPEC said. Another highlight of OPEC’s report is that total OECD commercial oil stocks—the cartel’s current metric for the production pact’s success—were just 9 million barrels above the latest five-year average, according to preliminary data for March 2018. OPEC’s production increased by 12,000 bpd in April over March to average 31.93 million bpd in April as Saudi Arabia boosted its production by 46,500 bpd, according to OPEC’s secondary sources. Slump in Venezuela’s production and lower output in Angola, Nigeria, and Qatar offset the increase in Saudi Arabia (still within its quota under the deal) as well as small increases in Algeria, Iran, and Libya. Venezuela’s crude oil production in April plunged by 41,700 bpd from March to average 1.436 million bpd, according to OPEC’s secondary sources.